Slack is almost used everywhere nowadays, especially because of their bot integration called Slack App. During a hackathon day, my coworkers and I decided to start building a bot using Python that will generate a JHipster app. The workflow is pretty simple, you send a message to the bot with the JHipster's configuration you want to use. Then the bot uses JHipster Online to generate your application and replies with the GitHub repository's link. 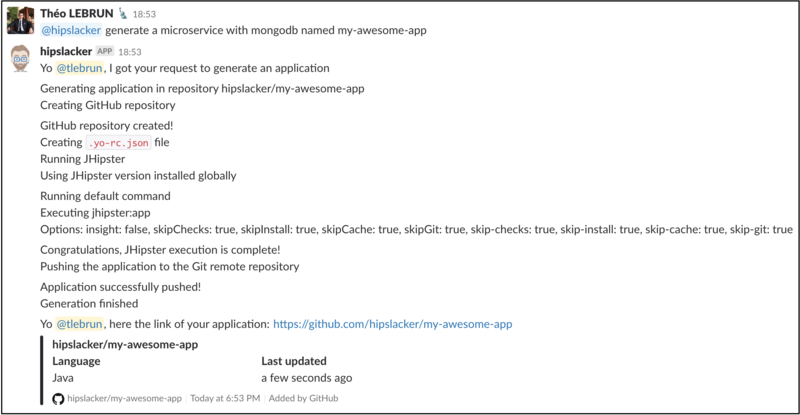 Here is an example of a command: @hipslacker generate a microservice with mongodb named my-awesome-app. As you can see, the message is very simple and looks like a real sentence. The reason is because we wanted to make the usage of the bot very simple and avoid having to specify all the JHipster's configuration. All the Python code from this blog post is on the GitHub repository of HipSlacker. You can easily setup your own bot by following the instructions in the README.md file. The main method is very simple, the bot connects to your workspace and parses messages with a given interval. When a message is mentioning the bot, the method handle_command is called and a HipSlacker object is created to process the command. The constructor of the class HipSlacker splits the command into multiple ones and the configuration (payload) is initialized with a default one. Then the bot parses the command's content and updates the configuration. The command can contain the application type, the name, the database type and the port. If you're familiar with JHipster, those parameters are no secret for you! For the application and database type, the bot simply looks for keywords and updates the configuration with correct values. For the port and the name, the bot uses the command after the keyword (ex: named my-awesome-app or port 8080). To generate your JHipster application with JHipster Online, the bot needs to retrieve a JSON Web Token (JWT) and then make a POST request to https://start.jhipster.tech/api/generate-application with a payload (which is the JHipster configuration). The library requests is used to make HTTP calls and the implementation is pretty simple. The response from the generate-application endpoint is an id and we can use this id to get the status of the generation. That way the bot will post the status of the generation on your Slack channel to keep you updated. Then the bot will post the link of the GitHub repository if the generation succeeded or an error if the generation failed. Since JHipster Online is on GitHub, you can host your own version. That is pretty useful if you want to use a specific version of JHipster or use a private version control service instead of GitHub. Creating a Slack bot using Python is pretty easy and by dedicating the application's generation to JHipster Online you will avoid a lot of extra work. The main challenge is how the bot parses commands and generates a JHipster's configuration from them. That all depends on how the bot generates the configuration and on how complex a command can be. A flow with questions/answers can be used to give the user more control on the JHipster's configuration. But in this case, why not simply use JHipster Online? Here is the GitHub repository for HipSlacker, feel free to open a pull request or maintain your own fork!